UPDATE: This doll sold for $4,977, which I believe includes the premium. 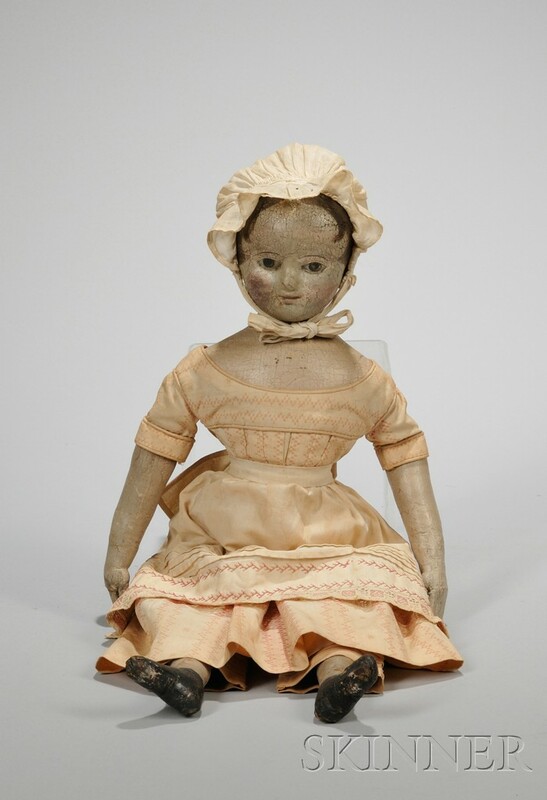 Oil-painted Cloth Izannah Walker Girl Doll, Rhode Island, c. 1860, painted brown eyes, pink mouth and cheek coloring, brown hair with center part in front of applied ears, painted arms and hands, cloth body with sloping shoulders, lower limbs painted with black shoes, white cotton undergarments, a pink striped patterned dress and embroidered apron with cotton bonnet, ht. 19 1/2 in., (paint wear, flesh tones of face old repaint, scattered retouch). The hammer price for this doll was $4,200.00 plus buyers premium and taxes. What a beauty! Wow, isn't she lovely! Do you think the final price was low? what a bargain Dixie !! Yes, that was a bargain. I think this doll had a bit of repaint, I'm not sure. Wish I'd been able to go to the auction to see her!